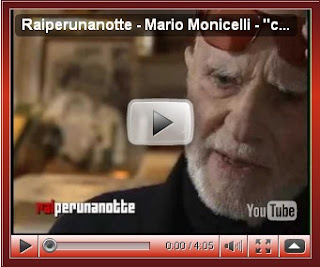 Even if my viewpoint is close to the reasons which yesterday night prompted Santoro to organize his protest event Raiperunanotte, with regard to content - always the most important element - the only guests that I really appreciated were Daniele Luttazzi and especially the director Mario Monicelli. The former, with the metaphor of a sodomized and happy Italy, for those who had not yet clear, gave another demonstration of what satire means. The latter has issued a message to save on the most precious hard drive of our memory. Among the things he said I remember two: "Hope is a trap devised by the landlords..."
Which is obviously an acute provocation, since shortly after the intelligent artist adds, "I hope that our film will end with a thing has never been in Italy… a beautiful revolution..."
The revolution I’d want would be a true revolution. The revolution I’d want would radically change things. The revolution I’d want completely cut away the diseased tree that has grown on our land. Not only the fruits rotted, but the whole plant. Who was wrong and who did nothing to stop it. Who stole and who stood by because nothing personally touched him. Who ruined this country and who still enriched playing the brave antagonist role. The revolution I’d want would bring out the true differences between people. The revolution I’d want would show who is coherent with what he says and who's not. The revolution I’d want would not be Left or Right, it would be first of all equal. Equal with those who exploited the ignorance of people to get their interests and those who have committed the same crime accusing the others. Equal with those who paid with their own flesh the consequences of this vile staging. Equal with those who had the courage to say no, even when yes was the poster of the good ones. The revolution I’d want would reset back all and everyone should start again. The revolution I’d want would only mention the reality of everyday life. The revolution I’d want would first mention the poorest person in the country. Consequently, all the politicians would exactly earn enough to survive, because representing people would already be an honor. The journalists would be the only requirement to be intellectually honest. The artists would have the privilege to be heard only by merit of their talent. The revolution I’d want would not need committed writers, enlightened intellectuals and exiled heroes because people would finally be able to think alone. The revolution I’d want would not need miraculous events organized on Facebook because people would always be in the streets every day. The revolution I’d want would not need leaders, spokespeople, number one stars, because each of us would be that one. The revolution I’d want is just a dream, because as Monicelli says, I have no hope on it. The News: Mario Monicelli: "We need a revolution…"
Stories and News, the Storytelling show: Tomorrow, Saturday March 27 2010, in Ferrara.